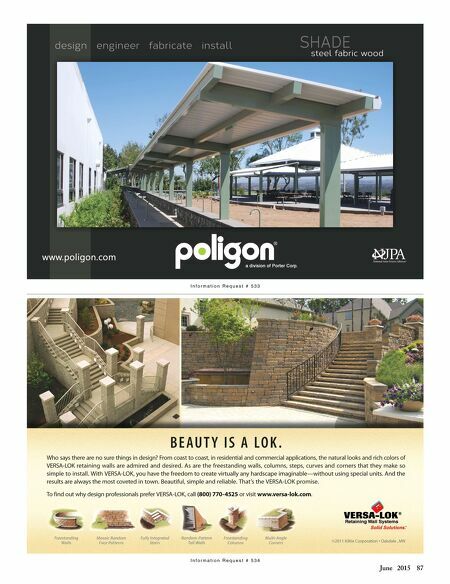 86 Landscape Architect and Specifier News Elements (Continued from page 84) low stumps to hear the latest information from their teachers about the day's activities, or gather here before returning indoor to classrooms. These stumps and the larger cable spools for the teachers can be combined and reorganized in creative ways by the classes. Surrounding the space are plantings to provide a subtle measure of separation from the rest of the campus, allowing breakout classes to continue with less interruption from other activities. Woodland Walk This special area beneath some trees will allow kids just a soupçon of the wonders of a deciduous forest. Using the site's existing trees for canopy cover, the designers placed a variety of logs, stones and woodland plants to inspire explorations. The logs can also be used as a small informal classroom. Here is also a spot for "climbing vine experiments," a place for kids to plant and care for various types of ornamental vines, and then watching their progress over the course of the year. It's also a good viewpoint to see the reclaimed timber infinity path, so named for the approximate shape it takes of the infinity symbol, which ties all of the spaces together. Play Structure A play structure and hill offer more active play and collaborative social interaction, including well- chosen loose toys for kids to exercise their creativity. The play structure is a platform for various activities, and even sports a small but functional green roof. Teachers will be able to remove the roof panels so the children can plant and maintain them, while learning about the benefits of a green roof. Although the space is small, the primary users are also small. Within that scale, the landscape architects feel the design provides many opportunities for fun and interesting outdoor activities, and that the site can hold together as a unified package. 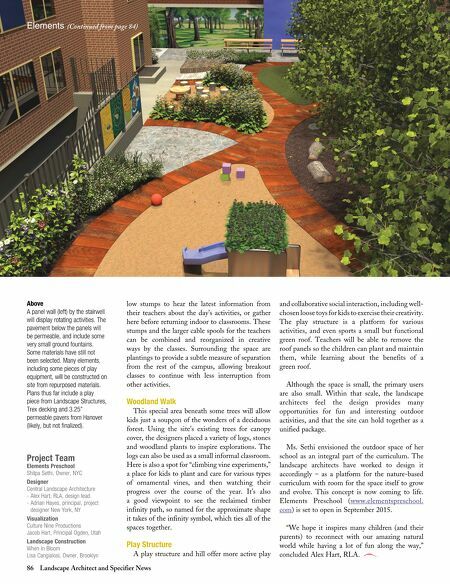 Ms. Sethi envisioned the outdoor space of her school as an integral part of the curriculum. The landscape architects have worked to design it accordingly – as a platform for the nature-based curriculum with room for the space itself to grow and evolve. This concept is now coming to life. Elements Preschool ( www.elementspreschool. com ) is set to open in September 2015. "We hope it inspires many children (and their parents) to reconnect with our amazing natural world while having a lot of fun along the way," concluded Alex Hart, RLA. Project Team Elements Preschool Shilpa Sethi, Owner, NYC Designer Central Landscape Architecture - Alex Hart, RLA, design lead - Adrian Hayes, principal, project designer New York, NY Visualization Culture Nine Productions Jacob Hart, Principal Ogden, Utah Landscape Construction When In Bloom Lisa Cangialosi, Owner, Brooklyn Above A panel wall (left) by the stairwell will display rotating activities. The pavement below the panels will be permeable, and include some very small ground fountains. Some materials have still not been selected. Many elements, including some pieces of play equipment, will be constructed on site from repurposed materials. Plans thus far include a play piece from Landscape Structures, Trex decking and 3.25" permeable pavers from Hanover (likely, but not finalized).